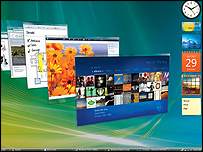 Microsoft launches its new operating system, Windows Vista, on Tuesday, promising "the wow starts now". We have selected two readers to explain what they like and don't like about the new operating system and two readers who are extolling the virtues of rival systems - the open source platform Linux and Apple's Mac OS X. Approximately six months ago I was given an opportunity to beta test Microsoft's latest operating system (OS) Windows Vista. I've been using Windows since 3.1 came out, so I immediately jumped at the offer. I really wasn't expecting something altogether different from previous versions, but immediately Vista proved to be in a league of its own. The first thing you notice when you get to the desktop is the appearance. It is visually stunning. One of the things that Microsoft has been boasting about is Windows Aero, which is an experience centered on 3D graphics. With features such as translucent windows, smoother window performance, and Windows Flip 3D, it just adds to the overall experience. Windows Flip 3D is by far my favourite. It's similar to Alt-Tab, but it brings up a 3D view of all the minimized windows. You can see what each window is and then select whichever one you want to view. Even though Vista requires more resources, (probably because it is more graphics oriented) it's more stable and performs better that any version that I've ever used. The most unique new feature is called Readyboost. When you're having performance issues due to insufficient memory, you can use a USB flash drive as an additional cache of memory to boost performance. It's an amazing OS. I really think that this one's going to give Apple Macs a run for their money. Being a software developer for the Windows platform, it is important that I keep up to date with the never-ending developments in PC technology, particularly those provided by Microsoft. I have been using Windows Vista for about one year now and seen it mature into the final product. A huge amount of research has been put into this new version which is evident in everything from the user interface right through to the new security model. This latest update provides many new components but the one which will provide the greatest change for windows users is the Windows Presentation Foundation - a set of components which allow graphics designers to produce visually stunning user interfaces. This new technology relies on the DirectX (a graphics technology provided on most modern graphics cards and also a requirement for the new Aero user interface) graphics engine to draw the interface leading providing new features such as 3D and animation. As an operating system for your average consumer there are also lots of great improvements, the new media player, a more intuitive user experience and easier backup facilities. I also like the way that all my existing hardware just works (although I am aware many other people have had problems). Boot time is much improved over XP and with the deep sleep option, it allows you to resume work from an almost zero power state in just a few seconds. Excessive demands on hardware also mean that many people may not choose to upgrade their OS, waiting instead until the PC is replaced. Whilst 512Mb is quoted as the minimum I would say that 1Gb is needed for a wait-free session. The graphics card must also support DirectX9 in order to display the Aero user experience - another expense if you don't have one already. In short though, I see windows Vista as a big improvement over Windows XP and would strongly suggest other PC users who have not explored beyond the Windows camp to upgrade. One of the advantages of Linux is its flexibility. 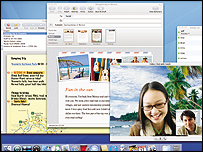 For the novice user it is straightforward to use, yet it also gives more experienced users radical powers over their computer which are not available in other operating systems. Also there is a huge variety of high quality, free software available for Linux, and using a package manager it is trivial to choose one of these thousands of applications and install it in a couple of clicks. Another significant advantage with Linux is that, unlike in Windows, there is no need to worry about security since viruses are very rare, no virus has yet spread successfully on the platform. And using powerful desktops such as KDE and Gnome with stunning visual effects it is able to look even better than Vista and OS X. Also, unlike Vista and OS X, Linux provides comprehensive support for languages such as Gaelic and Welsh. Unfortunately Linux's use is less widespread than the competition, which means that hardware and mainstream games often lack official support, so they can occasionally be difficult to install. However there are always many people on the internet ready to help out with any problems. What really sets Linux apart is its social significance provided by the free software license. It encourages users to share the software they love with their friends, rather than making the act of sharing illegal and branding it piracy. Also it encourages programmers to be better people, working in the open and allowing other programmers from across the world to help improve their software, rather than locking up their work with restrictive licences which prevent programmers from working together. The first thing I noticed after switching from Windows to Mac OS X almost six years ago is its complete lack of distractions. It is clean, uncluttered and lets me get on with my tasks. When I see Windows' reminders, popups, and other interruptions, I appreciate its absence in OS X. My Mac hardware and software looks great and is supremely functional. It seems someone has taken care of even the smallest details to make it work together seamlessly. One benefit I have found has been how little maintenance my Mac needs. It works for 11 hours a day, all week, and is restarted once over the weekend when I run a small maintenance utility. I don't remember the last time a programme crashed on me, and OS X itself has never crashed on me. Security is great, as you would expect with a system based on the industrial strength of Unix, although I do practise safe computing and don't take it for granted. This means I don't waste time on bugs and spyware (there are no viruses for OS X in the wild). Productivity in Excel spreadsheets, word processing, email and web surfing, photo processing and music all just seems to work (co-existing with Windows users too). I now feel like I am in charge of my computer rather than it being in charge of me. I find it hard to find things to criticise, except perhaps to say that new versions of iWork and iLife are produced each year and it is hard to resist buying each new version, modestly priced as they are.